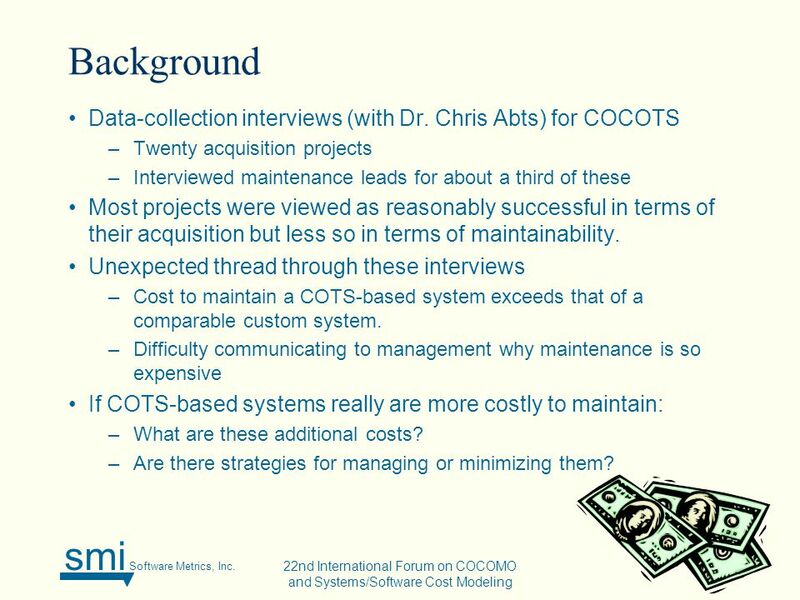 Smi Software Metrics, Inc. Added Sources of Costs in Maintaining COTS-based Systems Betsy Clark, Ph.D. Brad Clark, Ph.D. 22nd International Forum on COCOMO. 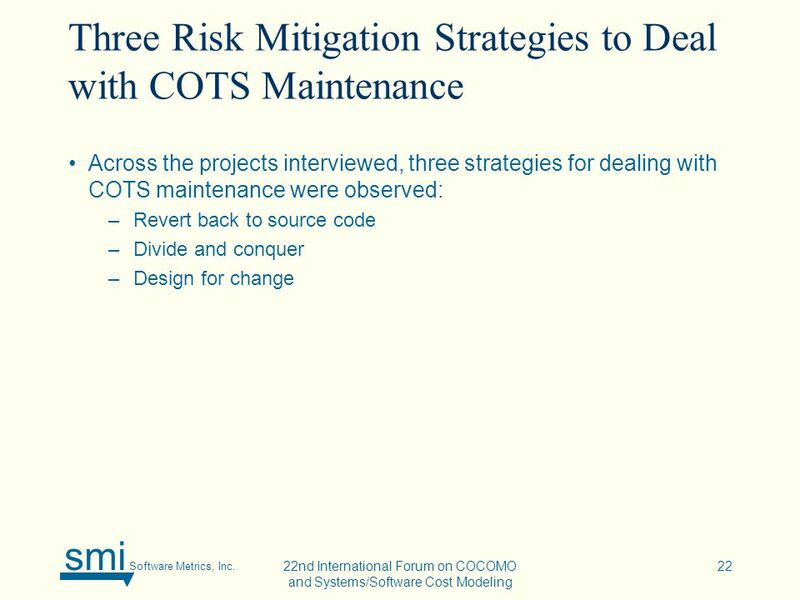 2 smi Software Metrics, Inc. 22nd International Forum on COCOMO and Systems/Software Cost Modeling 2 Background Data-collection interviews (with Dr. Chris Abts) for COCOTS –Twenty acquisition projects –Interviewed maintenance leads for about a third of these Most projects were viewed as reasonably successful in terms of their acquisition but less so in terms of maintainability. Unexpected thread through these interviews –Cost to maintain a COTS-based system exceeds that of a comparable custom system. –Difficulty communicating to management why maintenance is so expensive If COTS-based systems really are more costly to maintain: –What are these additional costs? –Are there strategies for managing or minimizing them? 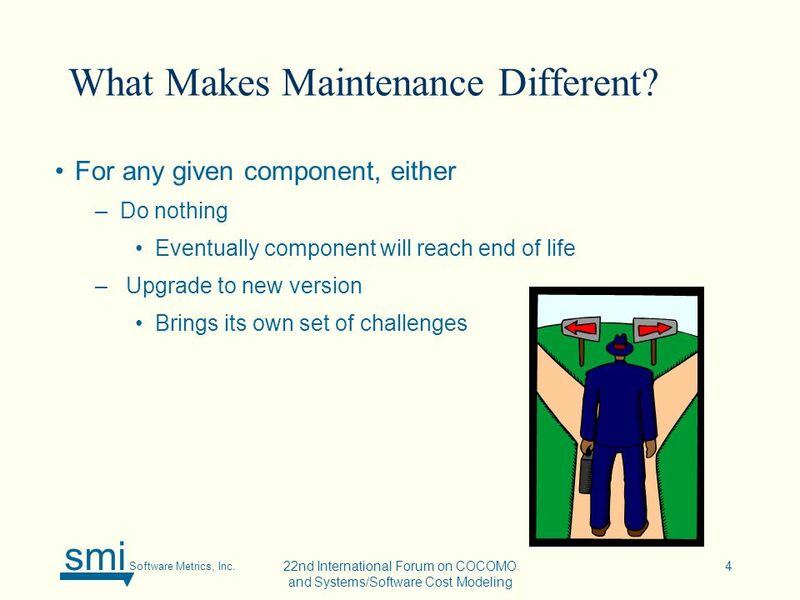 4 smi Software Metrics, Inc. 22nd International Forum on COCOMO and Systems/Software Cost Modeling 4 For any given component, either –Do nothing Eventually component will reach end of life – Upgrade to new version Brings its own set of challenges What Makes Maintenance Different? 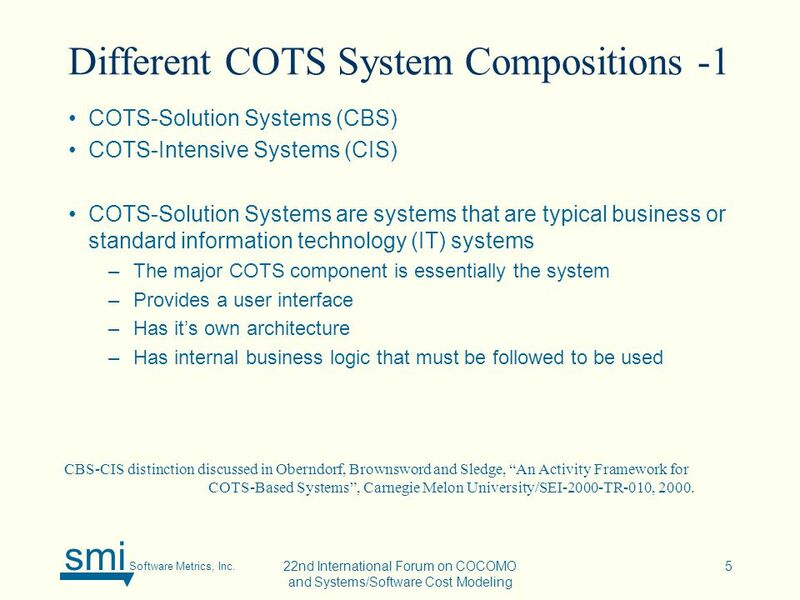 5 smi Software Metrics, Inc. 22nd International Forum on COCOMO and Systems/Software Cost Modeling 5 Different COTS System Compositions -1 COTS-Solution Systems (CBS) COTS-Intensive Systems (CIS) COTS-Solution Systems are systems that are typical business or standard information technology (IT) systems –The major COTS component is essentially the system –Provides a user interface –Has it’s own architecture –Has internal business logic that must be followed to be used CBS-CIS distinction discussed in Oberndorf, Brownsword and Sledge, “An Activity Framework for COTS-Based Systems”, Carnegie Melon University/SEI-2000-TR-010, 2000. 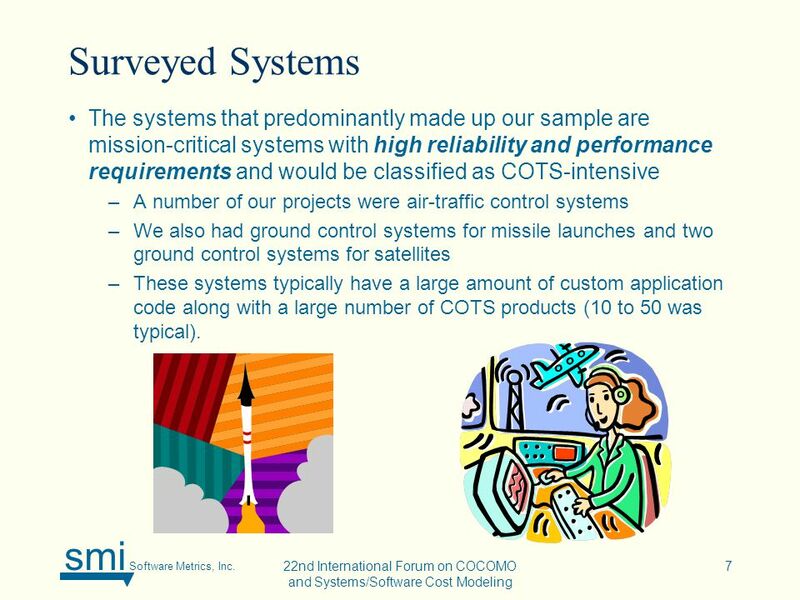 7 smi Software Metrics, Inc. 22nd International Forum on COCOMO and Systems/Software Cost Modeling 7 Surveyed Systems The systems that predominantly made up our sample are mission-critical systems with high reliability and performance requirements and would be classified as COTS-intensive –A number of our projects were air-traffic control systems –We also had ground control systems for missile launches and two ground control systems for satellites –These systems typically have a large amount of custom application code along with a large number of COTS products (10 to 50 was typical). 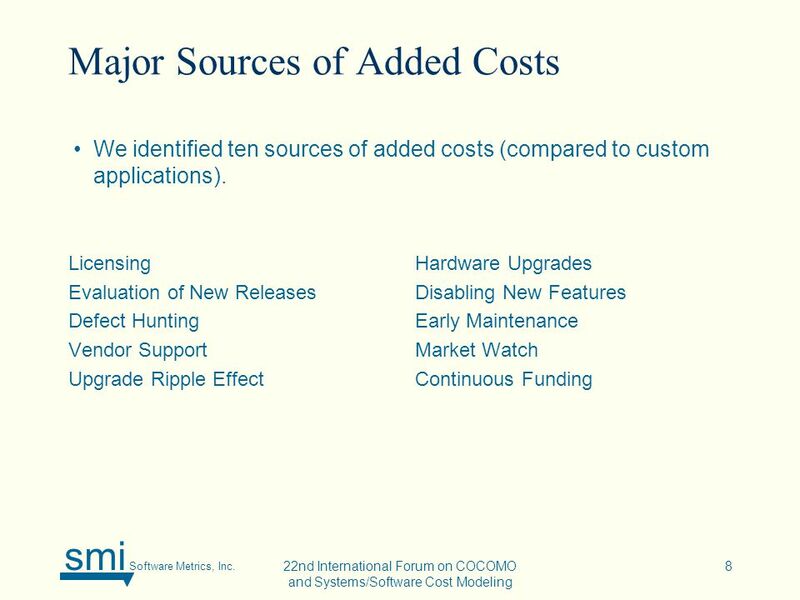 8 smi Software Metrics, Inc. 22nd International Forum on COCOMO and Systems/Software Cost Modeling 8 Major Sources of Added Costs Licensing Evaluation of New Releases Defect Hunting Vendor Support Upgrade Ripple Effect Hardware Upgrades Disabling New Features Early Maintenance Market Watch Continuous Funding We identified ten sources of added costs (compared to custom applications). 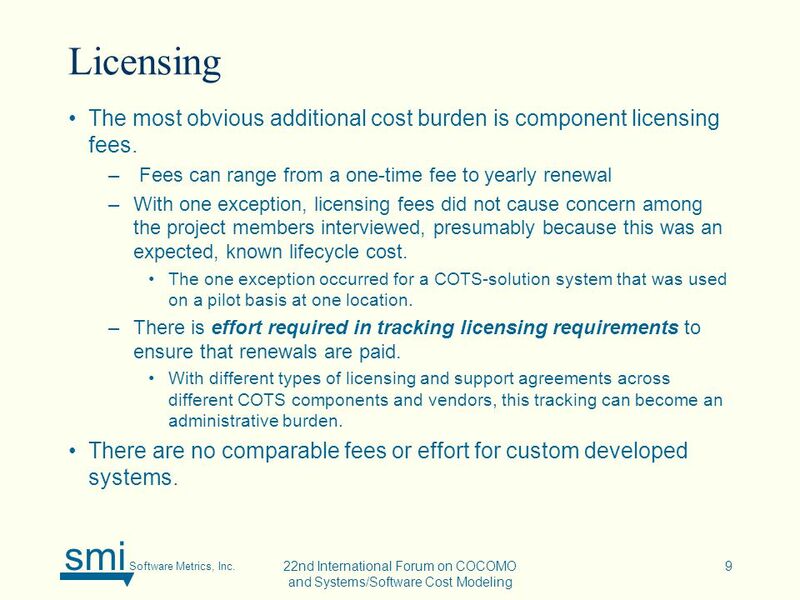 9 smi Software Metrics, Inc. 22nd International Forum on COCOMO and Systems/Software Cost Modeling 9 Licensing The most obvious additional cost burden is component licensing fees. – Fees can range from a one-time fee to yearly renewal –With one exception, licensing fees did not cause concern among the project members interviewed, presumably because this was an expected, known lifecycle cost. The one exception occurred for a COTS-solution system that was used on a pilot basis at one location. –There is effort required in tracking licensing requirements to ensure that renewals are paid. With different types of licensing and support agreements across different COTS components and vendors, this tracking can become an administrative burden. There are no comparable fees or effort for custom developed systems. 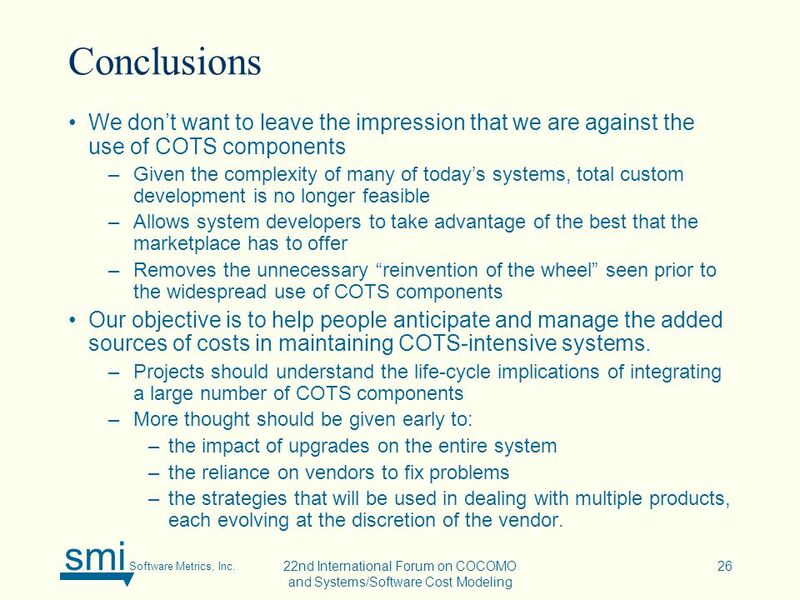 10 smi Software Metrics, Inc. 22nd International Forum on COCOMO and Systems/Software Cost Modeling 10 Evaluation of New Releases A major source of costs stems from COTS component volatility. 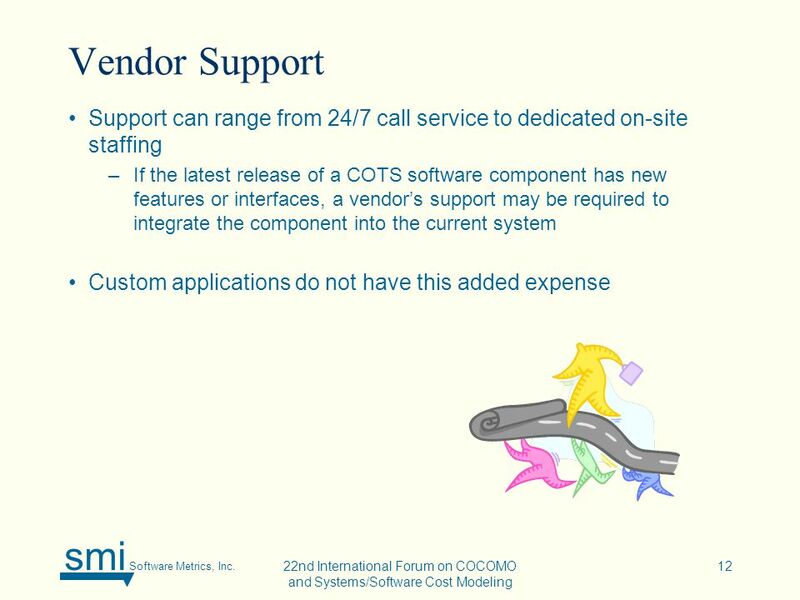 In contrast to custom-developed code, a COTS software component is controlled by the vendor. –The timing and content of releases is at the discretion of the vendor. 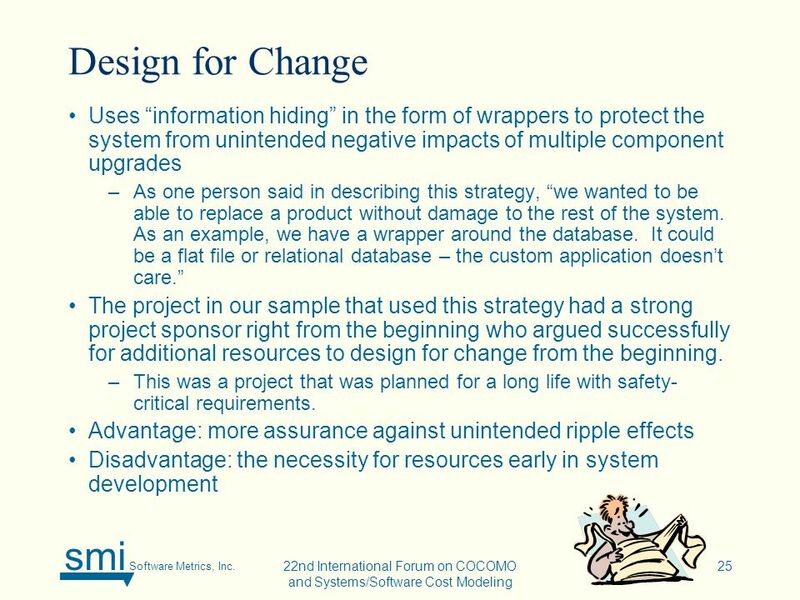 –Major effort may be required to evaluate and understand the implications of upgrading to a new component or perhaps switching to a whole new product entirely Evaluation activities require a test bed that can replicate all deployed system configurations of hardware and software. –For safety-critical systems, the amount of analysis can be large even though the ultimate decision may be to do nothing. The need for this ongoing black-box evaluation is unique to systems with COTS components. 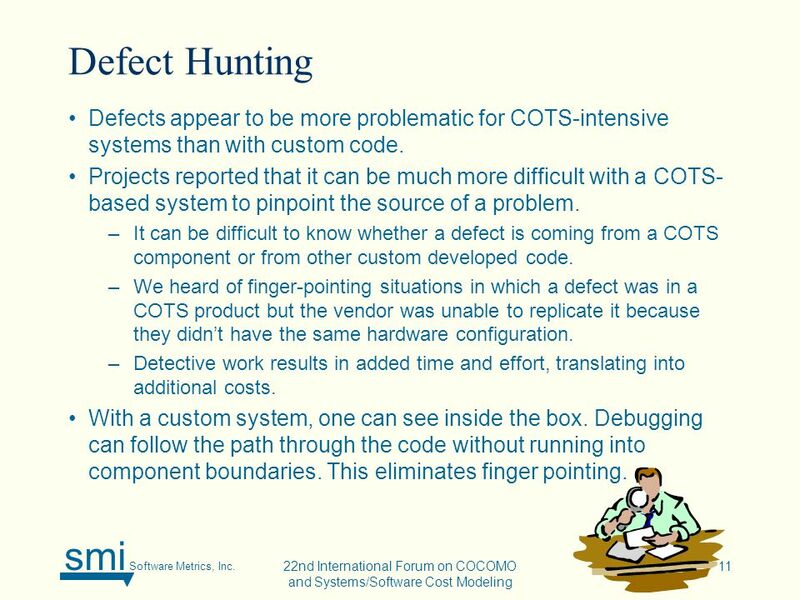 11 smi Software Metrics, Inc. 22nd International Forum on COCOMO and Systems/Software Cost Modeling 11 Defect Hunting Defects appear to be more problematic for COTS-intensive systems than with custom code. Projects reported that it can be much more difficult with a COTS- based system to pinpoint the source of a problem. –It can be difficult to know whether a defect is coming from a COTS component or from other custom developed code. –We heard of finger-pointing situations in which a defect was in a COTS product but the vendor was unable to replicate it because they didn’t have the same hardware configuration. –Detective work results in added time and effort, translating into additional costs. With a custom system, one can see inside the box. Debugging can follow the path through the code without running into component boundaries. This eliminates finger pointing. 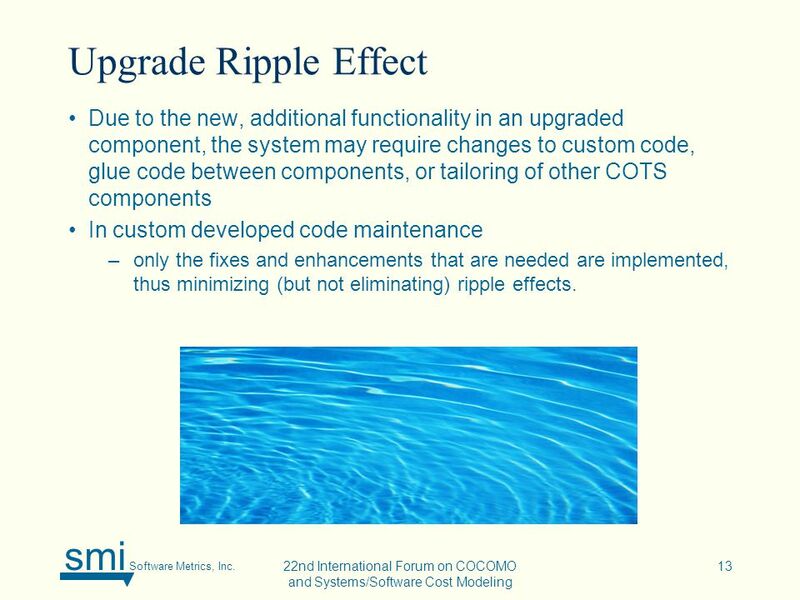 13 smi Software Metrics, Inc. 22nd International Forum on COCOMO and Systems/Software Cost Modeling 13 Upgrade Ripple Effect Due to the new, additional functionality in an upgraded component, the system may require changes to custom code, glue code between components, or tailoring of other COTS components In custom developed code maintenance –only the fixes and enhancements that are needed are implemented, thus minimizing (but not eliminating) ripple effects. 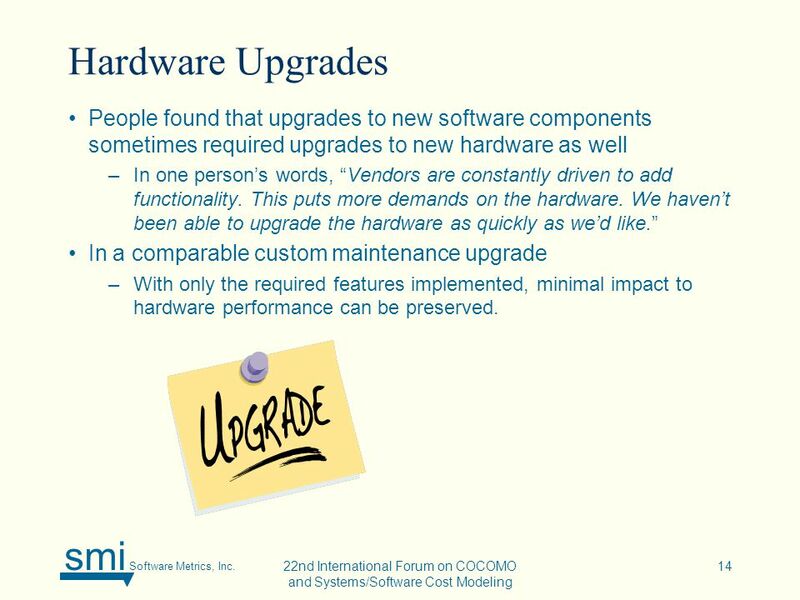 14 smi Software Metrics, Inc. 22nd International Forum on COCOMO and Systems/Software Cost Modeling 14 Hardware Upgrades People found that upgrades to new software components sometimes required upgrades to new hardware as well –In one person’s words, “Vendors are constantly driven to add functionality. This puts more demands on the hardware. We haven’t been able to upgrade the hardware as quickly as we’d like.” In a comparable custom maintenance upgrade –With only the required features implemented, minimal impact to hardware performance can be preserved. 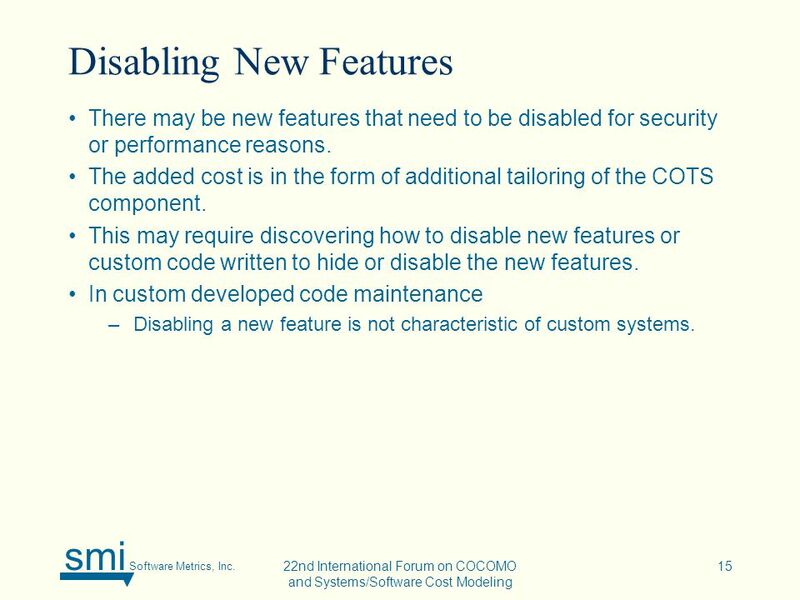 15 smi Software Metrics, Inc. 22nd International Forum on COCOMO and Systems/Software Cost Modeling 15 Disabling New Features There may be new features that need to be disabled for security or performance reasons. The added cost is in the form of additional tailoring of the COTS component. This may require discovering how to disable new features or custom code written to hide or disable the new features. In custom developed code maintenance –Disabling a new feature is not characteristic of custom systems. 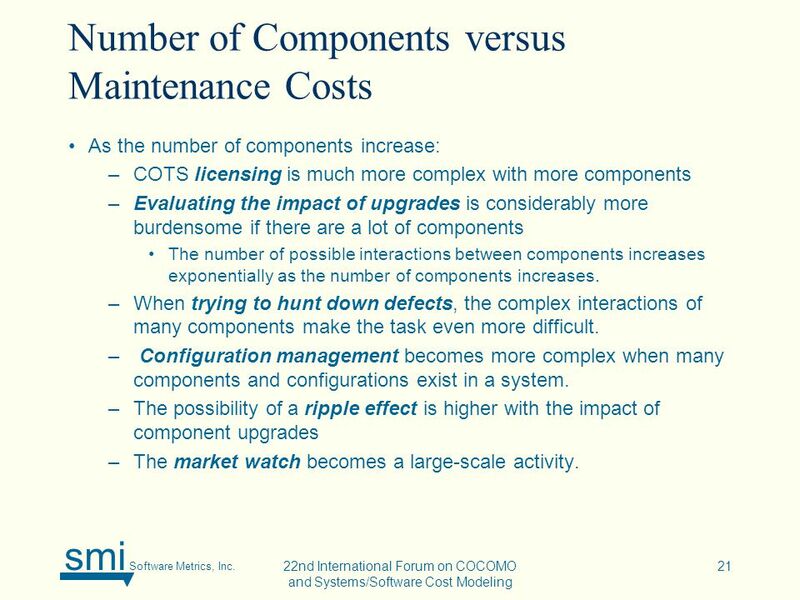 16 smi Software Metrics, Inc. 22nd International Forum on COCOMO and Systems/Software Cost Modeling 16 Early Maintenance Because COTS components continue to evolve in the marketplace, it is possible that upgrades may begin before the system is deployed, particularly if the development spans several years. If the components are not upgraded, it is possible that much of the system may have reached end of life before the system is even delivered. –This was the case for one of the projects interviewed; this system had an application base totaling more than one million lines of custom code plus a total of 45 COTS components. –Almost half of these components were obsolete by the time the system was deployed. 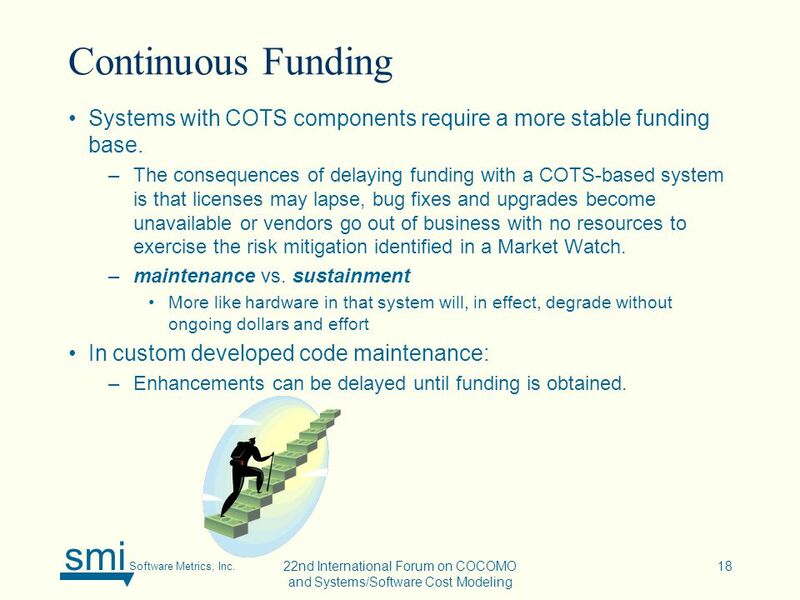 18 smi Software Metrics, Inc. 22nd International Forum on COCOMO and Systems/Software Cost Modeling 18 Continuous Funding Systems with COTS components require a more stable funding base. 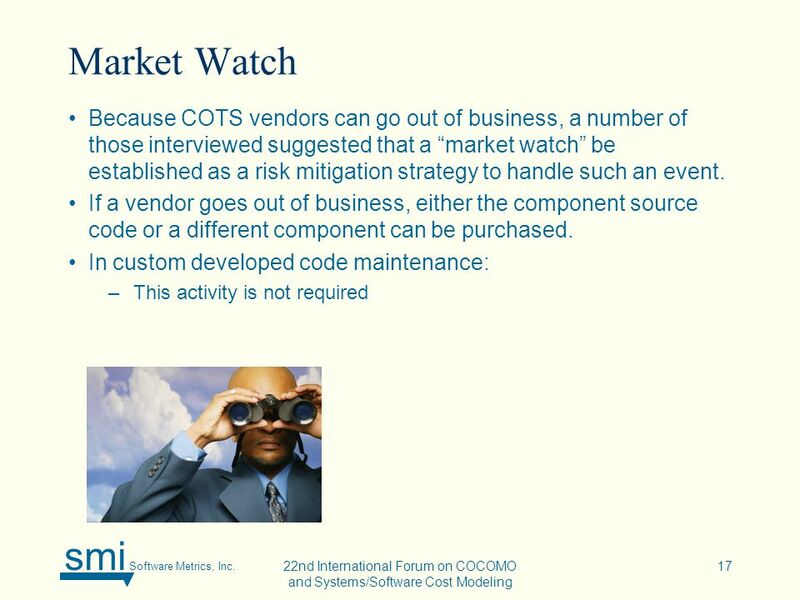 –The consequences of delaying funding with a COTS-based system is that licenses may lapse, bug fixes and upgrades become unavailable or vendors go out of business with no resources to exercise the risk mitigation identified in a Market Watch. 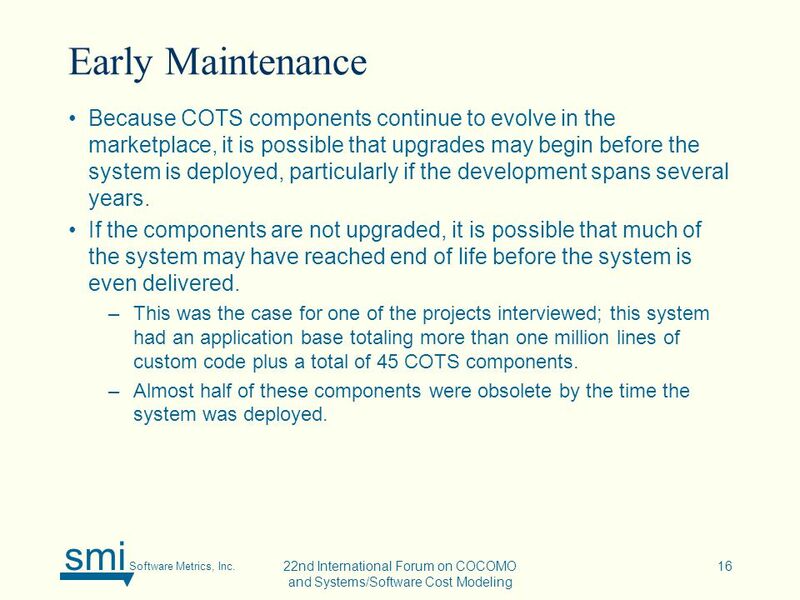 –maintenance vs. sustainment More like hardware in that system will, in effect, degrade without ongoing dollars and effort In custom developed code maintenance: –Enhancements can be delayed until funding is obtained. 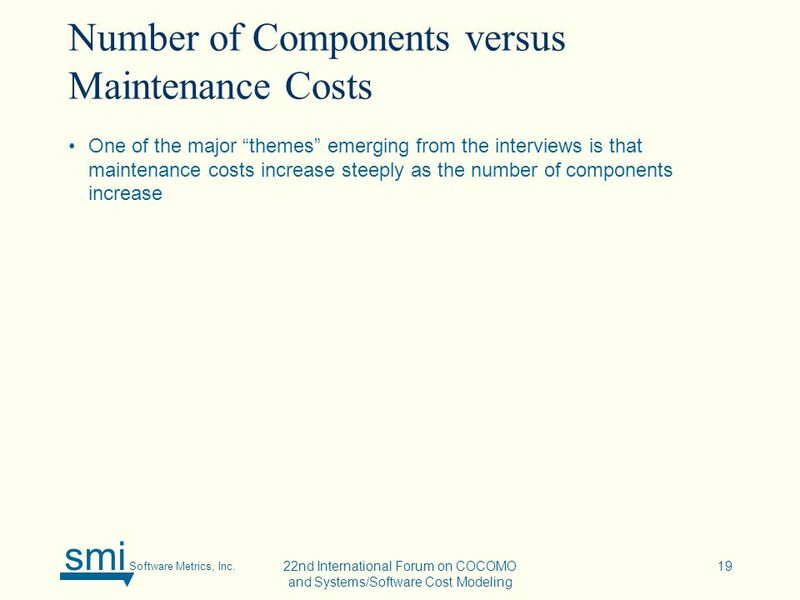 21 smi Software Metrics, Inc. 22nd International Forum on COCOMO and Systems/Software Cost Modeling 21 Number of Components versus Maintenance Costs As the number of components increase: –COTS licensing is much more complex with more components –Evaluating the impact of upgrades is considerably more burdensome if there are a lot of components The number of possible interactions between components increases exponentially as the number of components increases. –When trying to hunt down defects, the complex interactions of many components make the task even more difficult. – Configuration management becomes more complex when many components and configurations exist in a system. –The possibility of a ripple effect is higher with the impact of component upgrades –The market watch becomes a large-scale activity. 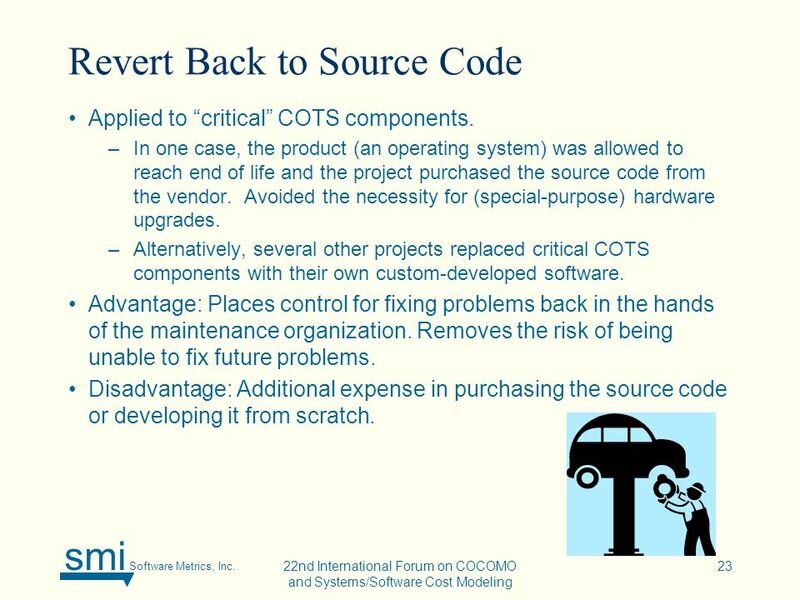 23 smi Software Metrics, Inc. 22nd International Forum on COCOMO and Systems/Software Cost Modeling 23 Revert Back to Source Code Applied to “critical” COTS components. –In one case, the product (an operating system) was allowed to reach end of life and the project purchased the source code from the vendor. Avoided the necessity for (special-purpose) hardware upgrades. –Alternatively, several other projects replaced critical COTS components with their own custom-developed software. Advantage: Places control for fixing problems back in the hands of the maintenance organization. Removes the risk of being unable to fix future problems. Disadvantage: Additional expense in purchasing the source code or developing it from scratch. 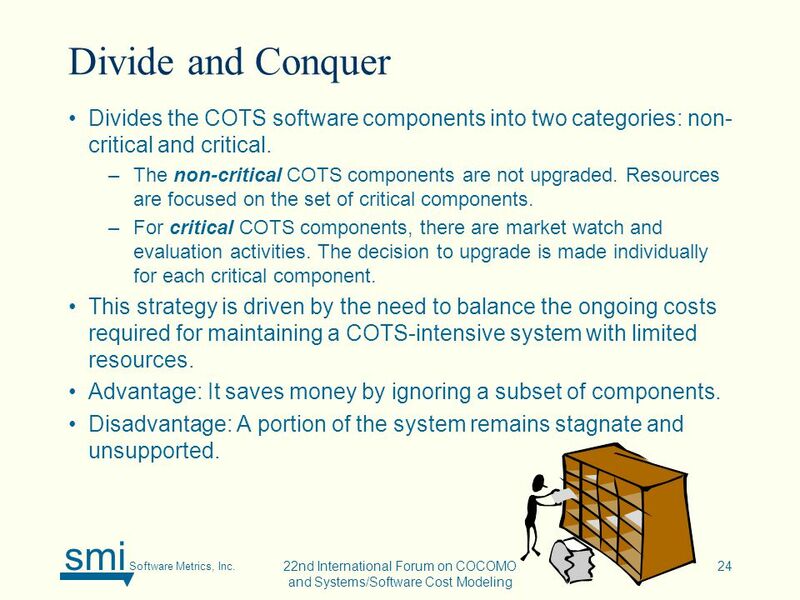 24 smi Software Metrics, Inc. 22nd International Forum on COCOMO and Systems/Software Cost Modeling 24 Divide and Conquer Divides the COTS software components into two categories: non- critical and critical. –The non-critical COTS components are not upgraded. Resources are focused on the set of critical components. –For critical COTS components, there are market watch and evaluation activities. The decision to upgrade is made individually for each critical component. This strategy is driven by the need to balance the ongoing costs required for maintaining a COTS-intensive system with limited resources. Advantage: It saves money by ignoring a subset of components. Disadvantage: A portion of the system remains stagnate and unsupported. 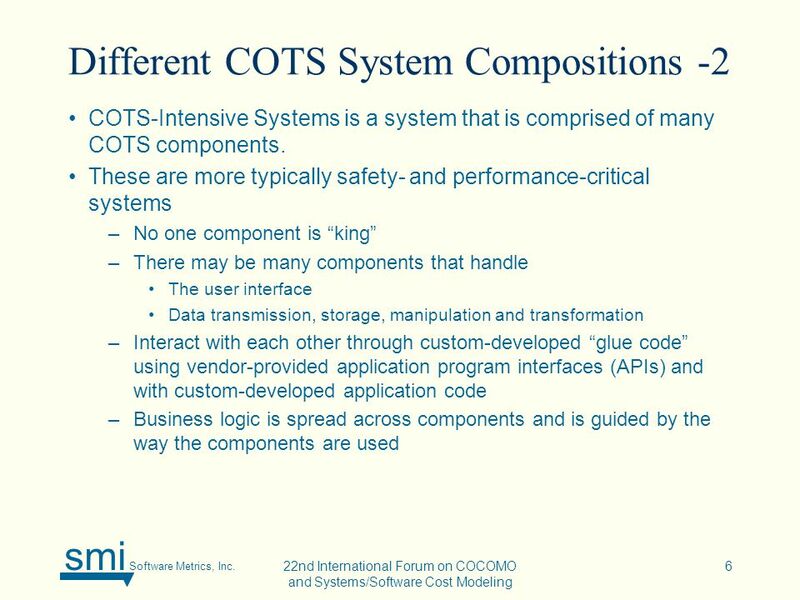 26 smi Software Metrics, Inc. 22nd International Forum on COCOMO and Systems/Software Cost Modeling 26 Conclusions We don’t want to leave the impression that we are against the use of COTS components –Given the complexity of many of today’s systems, total custom development is no longer feasible –Allows system developers to take advantage of the best that the marketplace has to offer –Removes the unnecessary “reinvention of the wheel” seen prior to the widespread use of COTS components Our objective is to help people anticipate and manage the added sources of costs in maintaining COTS-intensive systems. 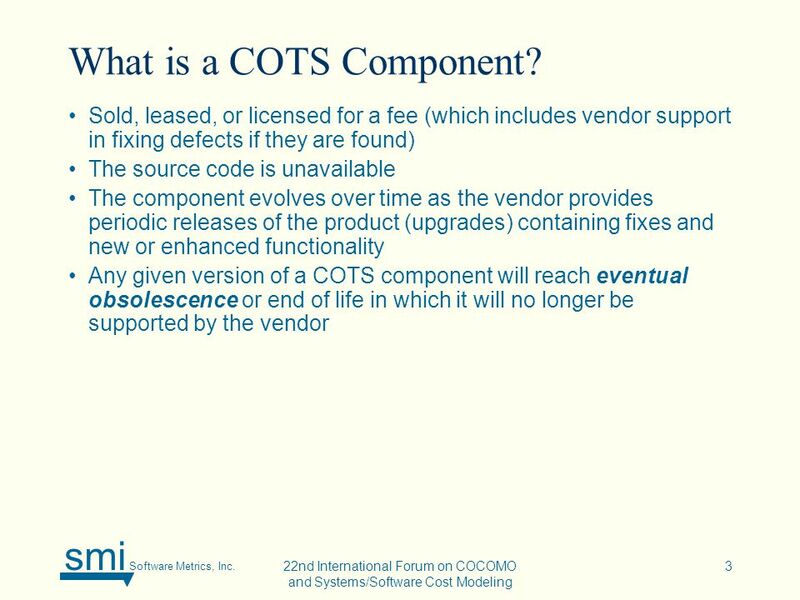 –Projects should understand the life-cycle implications of integrating a large number of COTS components –More thought should be given early to: –the impact of upgrades on the entire system –the reliance on vendors to fix problems –the strategies that will be used in dealing with multiple products, each evolving at the discretion of the vendor. 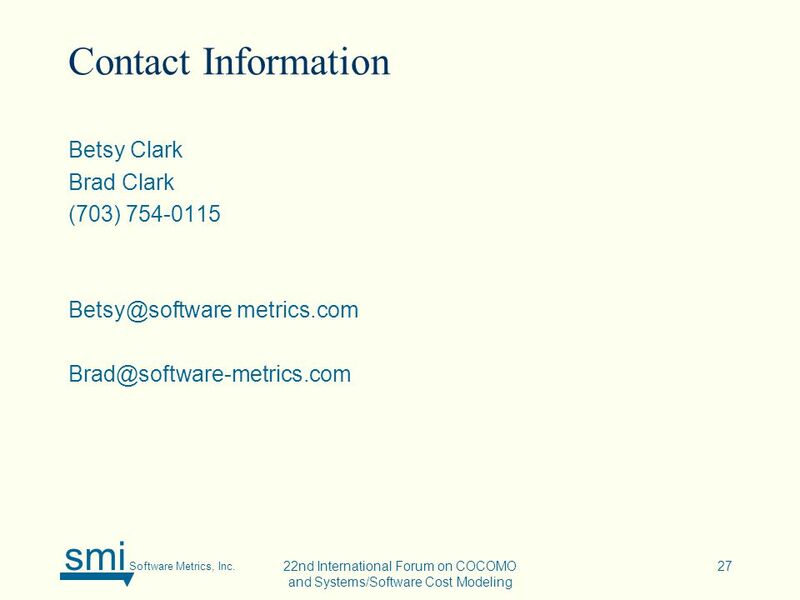 28 smi Software Metrics, Inc. 22nd International Forum on COCOMO and Systems/Software Cost Modeling 28 References Presentation Source: Clark, Betsy and Clark, Brad. 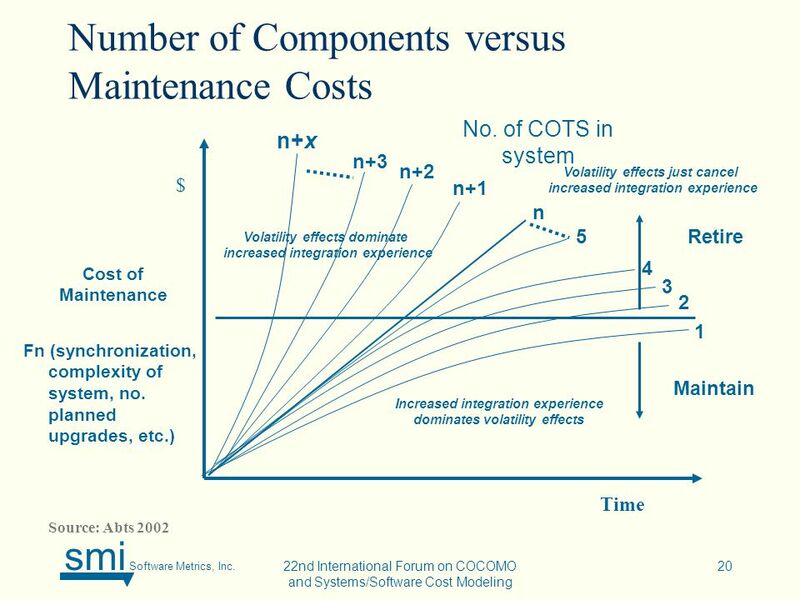 “Added Sources of Costs in Maintaining COTS-Intensive Systems.” CrossTalk The Journal of Defense Software Engineering, June 2007. http://stsc.hill.af.mil/crosstalk/2007/06/index.html Abts 2002: Abts, Chris. 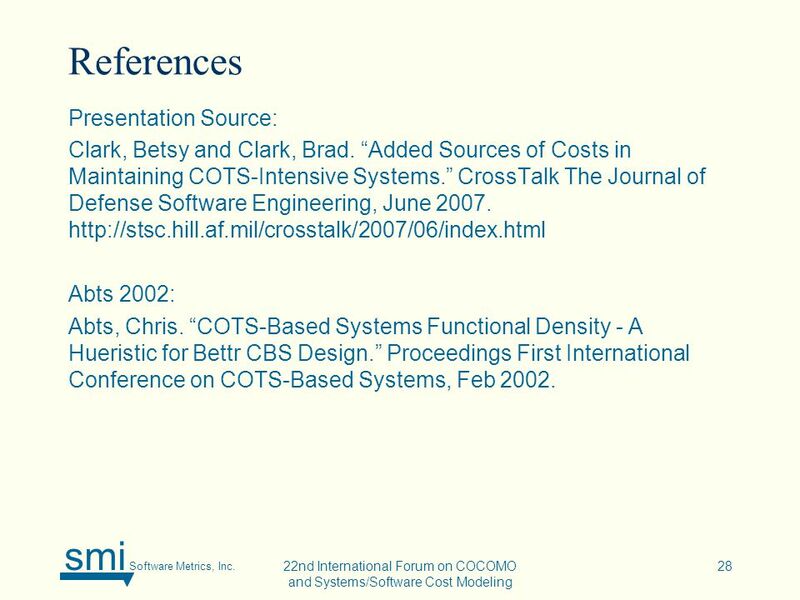 “COTS-Based Systems Functional Density - A Hueristic for Bettr CBS Design.” Proceedings First International Conference on COTS-Based Systems, Feb 2002. 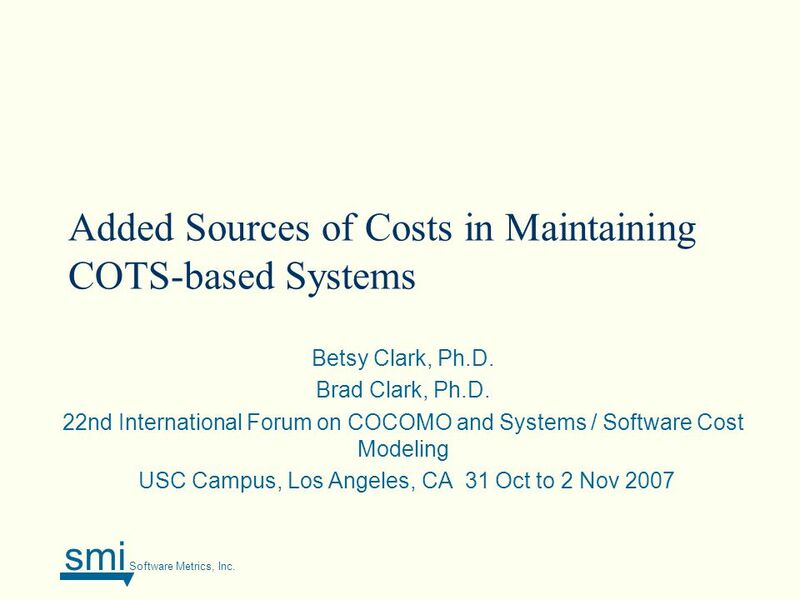 Download ppt "Smi Software Metrics, Inc. Added Sources of Costs in Maintaining COTS-based Systems Betsy Clark, Ph.D. Brad Clark, Ph.D. 22nd International Forum on COCOMO." McGraw-Hill/Irwin Copyright © 2007 by The McGraw-Hill Companies, Inc. All rights reserved. Chapter 20 Systems Operations and Support. 1 H2 Cost Driver Map and Analysi s Table of Contents Cost Driver Map and Analysis 1. Context 2. Cost Driver Map 3. Cost Driver Analysis Appendix A - Replica. Predictor of Customer Perceived Software Quality By Haroon Malik. The “Lifecycle” of Software. Chapter 5. Alternatives to the Waterfall Model The “Waterfall” model can mislead: boundaries between phases are not always. Software Engineering Institute Carnegie Mellon University Pittsburgh, PA Sponsored by the U.S. Department of Defense © 2001 by Carnegie Mellon. Software Construction and Evolution - CSSE 375 Software Maintenance at 30K Feet Shawn and Steve Left – Tibet from ft. (~9 km). COCOMO II Calibration Brad Clark Software Metrics Inc. Don Reifer Reifer Consultants Inc. 22nd International Forum on COCOMO and Systems / Software Cost. 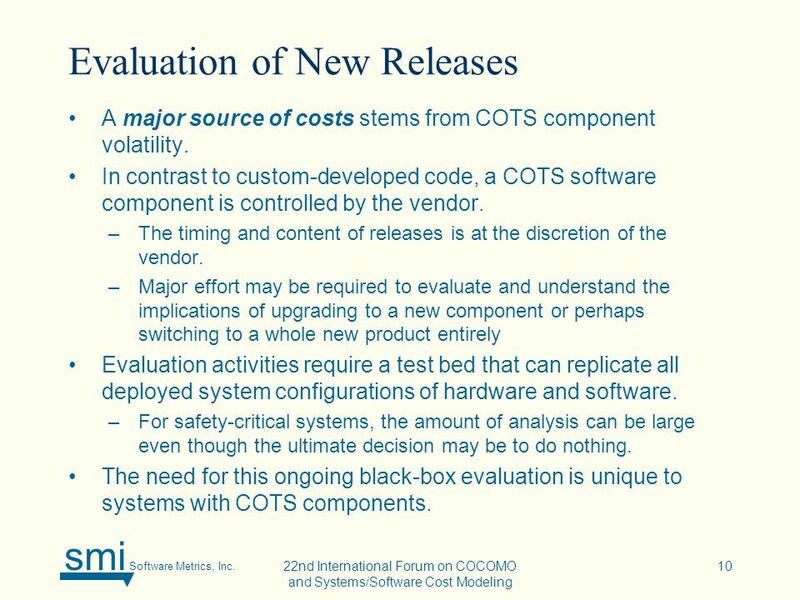 Costs of Security in a COTS-Based Software System True Program Success TM Costs of Security in a COTS-Based Software System Arlene Minkiewicz, Chief Scientist. Modified from Sommerville’s originalsSoftware Engineering, 7th edition. Chapter 21 Slide 1 Software evolution. COTS Metrics and Modeling Working Group Chris Abts, Vic Basili, Jim Cannon, Brad Clark, Nancy Eickelmann, Peter Hantos, Keun Lee, Gary Thomas, Lori Vaughn. Xtreme Programming. Software Life Cycle The activities that take place between the time software program is first conceived and the time it is finally. LECTURE 5 Nangwonvuma M/ Byansi D. Components, interfaces and integration Infrastructure, Middleware and Platforms Techniques – Data warehouses, extending.